Editors Note: Another guest contribution from R.Ann Parris to The Prepper Journal. As always, if you have information for Preppers that you would like to share and be entered into the Prepper Writing Contest with a chance to win one of three Amazon Gift Cards with the top prize being a $300 card to purchase your own prepping supplies, then enter today! One of the challenges when we get into preparing for disaster is keeping everything neat and organized. In some cases, we’re trying to maintain our own or a spouse’s sanity and keep some of our preparations neat, tidy and organized without being in plain sight while short on space, either square footage or because we rarely allow something to leave our grasp. 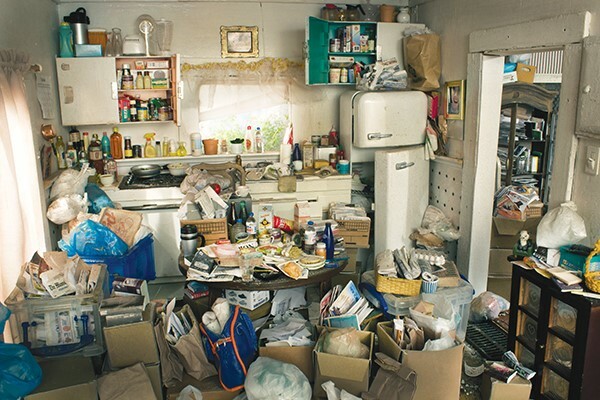 Beyond the ease in counts and condition checks, and avoiding a hoarder’s larder, organization can help us with both rotating supplies and in some cases even rationing our supplies should we fall on hard times. Happily, there’s lots of stuff out there that can help us. Repurposing some items that are inexpensive, commonly found curbside and at flea markets or yard sales, or that we might already have laying around can help us maintain that organization without breaking the bank. Keeping our wrapping paper neat and tidy might not appeal to preppers, but we can steal some of the ideas out there for keeping our maps, charts, and our property plats accessible and tidy. 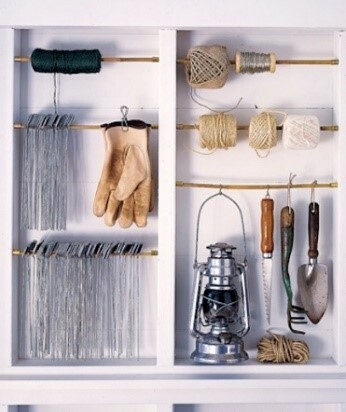 There’s one where you take an old wire shelf and affix it vertically to a wall or door instead of horizontally. 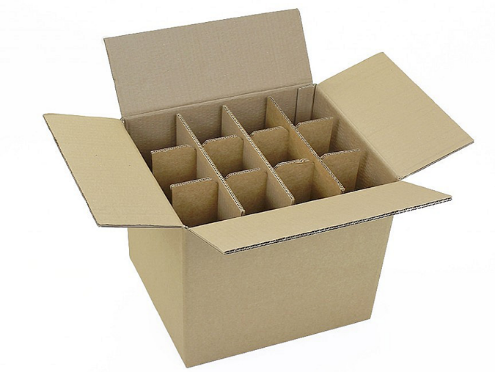 The 250ml wine boxes are ideal for keeping both maps and wrapping paper contained and neat, and most alcohol retailers are simply delighted to let you have boxes. 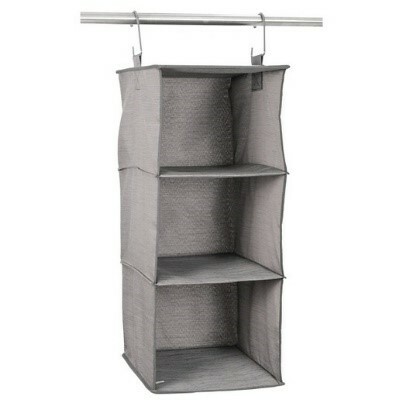 Cutting the bottoms out of hanging shoe organizers lets us customize height. 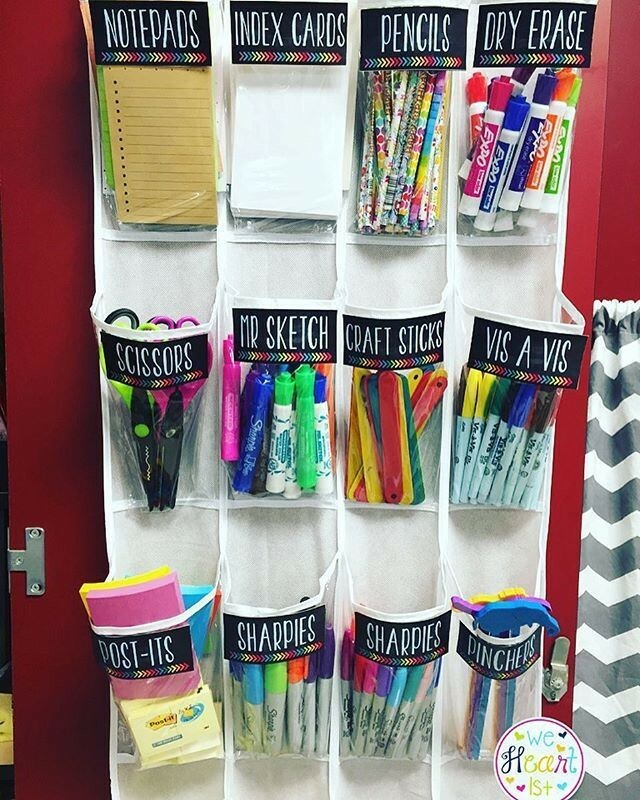 That one has added benefits because you can leave pouches intact to keep map pens, sprays, and dry erase markers and erasers right there with them. It also allows some mobility, so they can be re-hung by a work board, in a radio or control room, or at the desk and table where you do your planning. You have to watch the weight in these guys, but otherwise, the sky is the limit. They can hook us up in pretty much all wedges of our preparedness “health” wheels. I’ve got some in use for “daily” life, too. One’s in the kitchen keeping small packets of instant cereal and snack foods and the last bar of one kind or another from either getting lost in the abyss or from having the boxes continue to eat up space. 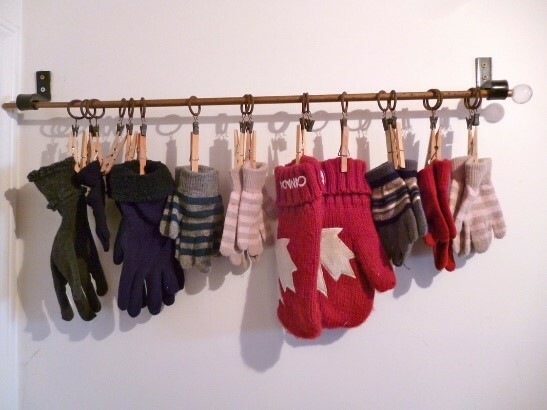 One’s for winter, and keeps hats, scarves, and gloves neat and organized. The bottom row holds some quick slip-on slippers for household members and the dogs’ various booties. There’s another set up with each person’s preferred garden and yard work sets of gloves and pocket detritus. For preppers, the value goes up further. 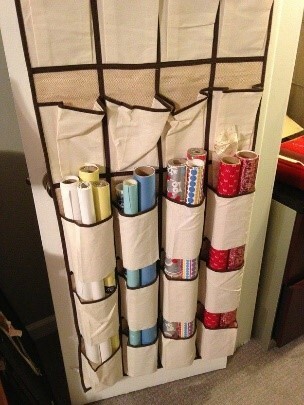 With stick-on labels or clothespins, we can use them to track dates for at-a-glance organization. We can also take a space where we would be limited to boxes or shelves and turn it into basically a rack for them. A couple of freebie curbside-pickup filing cabinets, a bar or two to go across the top, and we can string our organizers on dowels or sturdy branch/sapling trimmings. The filing cabinets here are actually reading nooks, but it gives you an idea of how the addition of a plank (freebie-pickup shipping pallets, walls/shelves from curbside bookshelves) and a curtain (surviving sheet from a wrecked bedding set) can keep it from being “ugly” even if it’s out in a home where somebody cares. 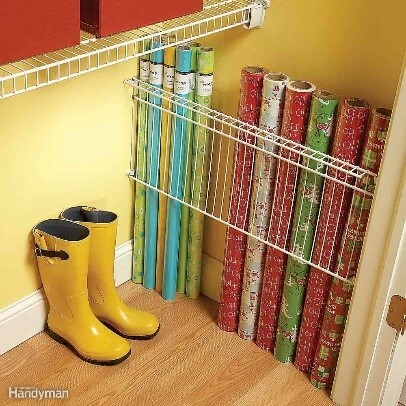 If appearance is less of a concern, some suit hangers and any ol’ pole can be hung in sheds, basements or a storage room to accomplish the same – a flip or slide-through storage area for small items. Those items can be anything. It can be a great way to keep veggie seeds separated by planting/growing season and year. We can use them for sewing supplies or art supplies. 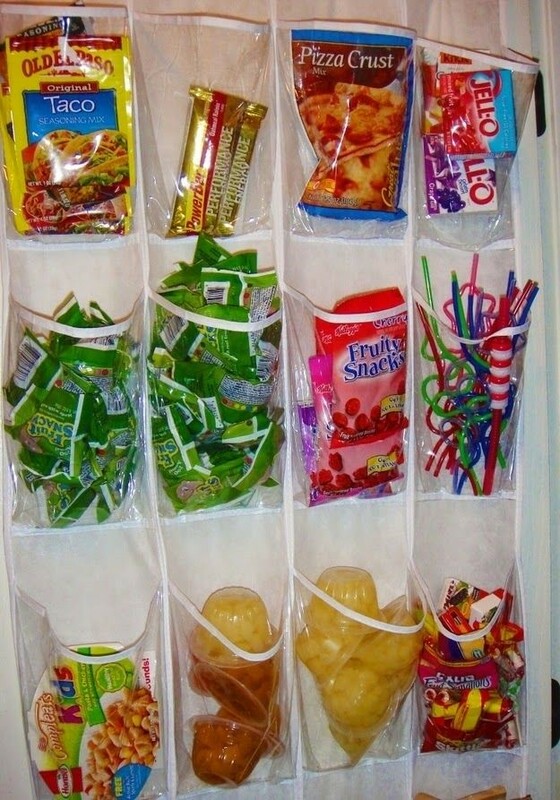 Instant drink packets, seasoning packets and shakers, granola bars, little packets of vitamin-rich gummy treats, boxes and packets of pudding or gelatin mixes, and other kitchen items fit easily. We can arrange them to be a general category like snacks or spices, or we can set each up by expiration or best-by date. Educational goodies, supplies for the radio room or office, entertainment items, hygiene items, and especially first-aid and medical items that do start separating or losing efficiency are all other options for storing someplace we can find and see them easily and check those dates without pawing through boxes. We can use hanging closet organizers much the same way to buy some extra space, although they’re not as handy for the tiny little items and still have the weight restrictions. We can also use them to help us ration, just like we can with canning jars. We can pack each with a week, a month, or a quarter’s “goodies”. That can be seasonings or instant helpers like gravy or dressing mix. It can also be things like chocolate chips, tea bags or a brick of coffee, smaller packets of cookie, edible cake decorations, or Slim Jim’s. Some of the shoe organizers are big enough we could even seed them with fresh games like Qwixx or Dog Bites Man, new decks of cards, some specialty feel-good lotion or chap stick, or something seasonal to brighten the mood. 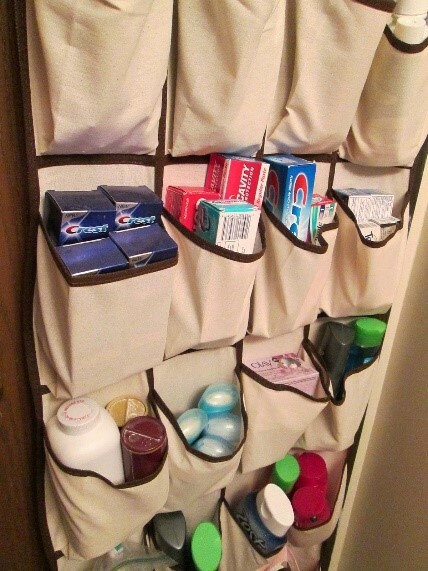 Another option is to use a shoe organizer as a pre-staging area. Rather than those things that jump in buggies getting tossed in a box or drawer for a while, they can get slotted by category. It can also help with those items that seems like a great idea but then hide when we want them. That can be everything from eyeglass repair kits and those mini sewing kits, to things like outlet and light-switch wall plates, overhead pull cords, and those plastic twisty-cap wire connectors that like to multiply in drawers and tool rooms. While we’re hanging things to improve our organization, we can keep an eye out for curtain rods. 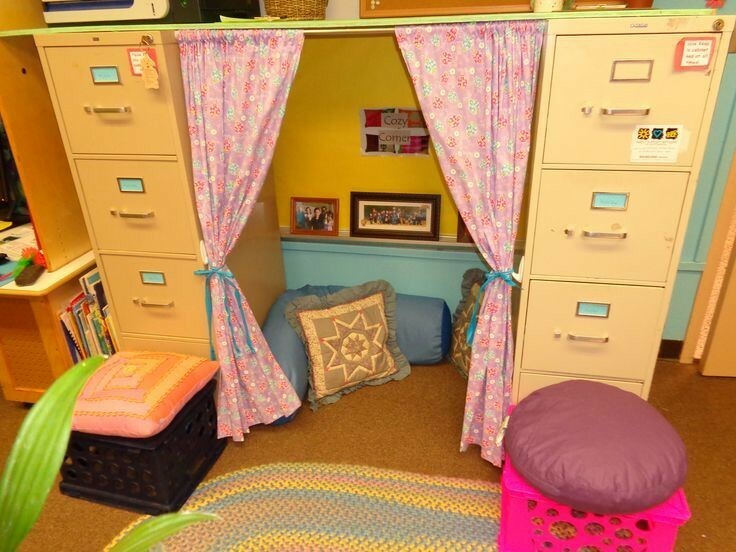 With some rings and-or big S-hooks, they can help us in all kinds of spaces. 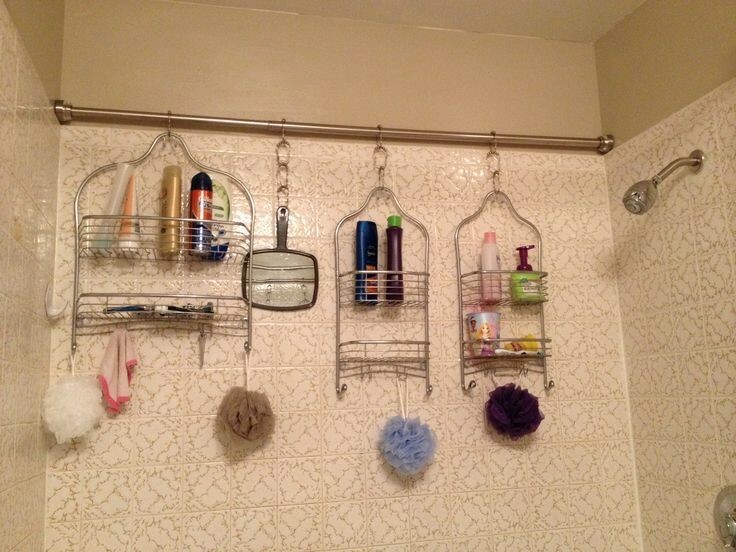 We can mount them in our bathrooms – and our outdoor camping/solar showers – to drape bathroom organizers and avoid having stuff sit on ledges and floors. With hooks affixed to light baskets and tubs, what we can hang for easy access increases even further. 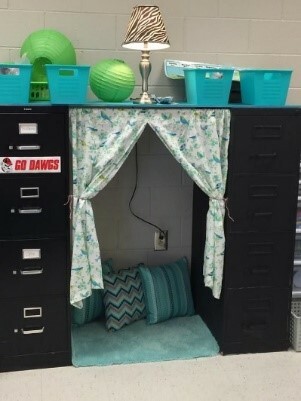 Those baskets can easily be the bathroom organizers or oddball dishwasher or silverware baskets that show up here and there or wire or plastic bins form the dollar store, and get used for school and office supplies, kitchen spices, each individual’s hankies and bandanas, or anything else we like. We can arrange them under cabinets or against walls to keep items like spools of thread, bungee cords, and weed-eater wire accessible. 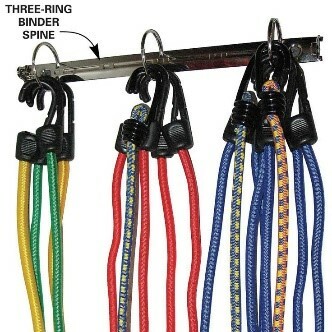 With hooks or loops, we can add our extension cords, gloves, and tools. By our doors, they’re another easy way to keep hats and gloves organized, and the airflow they’ll get will let them dry faster. While I specified curtain rods, be flexible while we’re upcycling and repurposing. I see swingsets and bed frames on freebie listings and by the curb on a regular basis. Tree trimmings can yield nice, straight pieces. The scrap guys in town will let us have pretty much whatever we want at about a halfway between their cost and sale price. Be flexible. We can use all kinds of oddball wrecked, found, used, or inexpensive items for storage, although the garage and shed where we don’t have to hear anything from family members really shines. 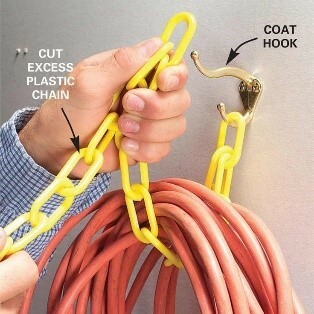 We can use coat hangers and hooks with a piece of looped rope, chain, or bungee cord to keep heavy extension cords, hoses, and heavy rope neatly coiled and off the flat surfaces. A wrecked binder offers three rings that can hold anything, from our bungee cords to cleaned cans with a hole punched that can then hold our paint brushes, garden pruners, gloves, or safety glasses. 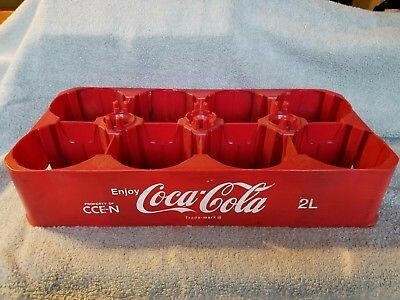 You have to pretty much murder somebody to find them now, but a plastic 2L soda bottle is awesome for allowing us to stack and move bottles and for keeping stuff in a pickup or van right where you want it. They can also be screwed flat to a wall to use the holes as shallow storage nodes, but they’re too shallow to have much value for me there. Instead, see if a plumbing outfitter or company has PVC scrap. It’s usually deeper and you can cobble that into a honeycomb with some screws and get a lot more use out of it. All kinds of things that hit our recycling and trash have other uses, particularly in keeping our storage neat and tidy. The cardboard boxes that soda comes in get a lot of play for upcycling into soup and veggie can organizers, but we can also just slit the top off entirely. Swiffer pad tubs are awesome for stacking and labeling the sides, but really only for lightweight stuff. Old-school laundry detergent boxes with the flip-up lid and the little plastic handle are sturdy, stackable, and you can hook that handle around a screwdriver on your belt or a carabiner for hands-free carrying. 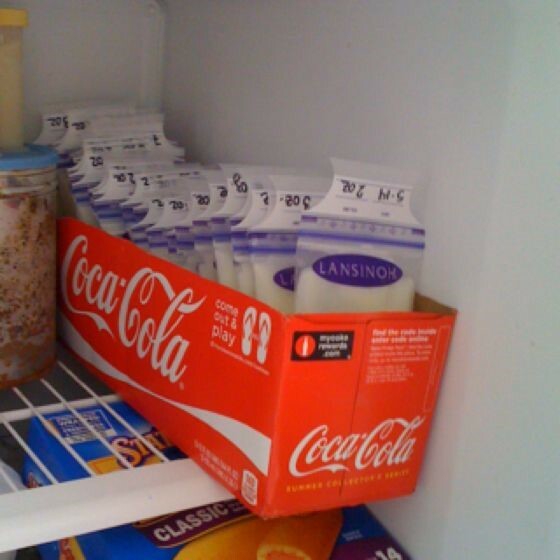 Plastic coffee cans, jugs, powdered parmesan shakers, and creamer tubs are hugely versatile. 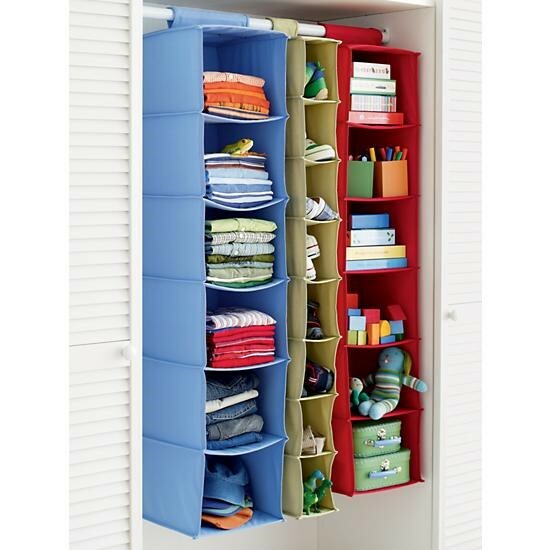 Indoors or out, they can help us organize absolutely anything. Arrange packets of Lipton and Knorr sides, seeds, Heartgard and Frontline, or spice blends. Keep extension cords, tow cables, tie-down straps, or Christmas lights neat and tidy, and ready to deploy again (which buys time and space for other stuff). They can also help us keep kits of commonly replaced items together. 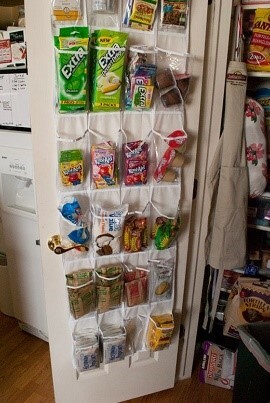 The plastic options can help us keep pests out of dry pantry goods and little packets of drinks or boxes of pudding. 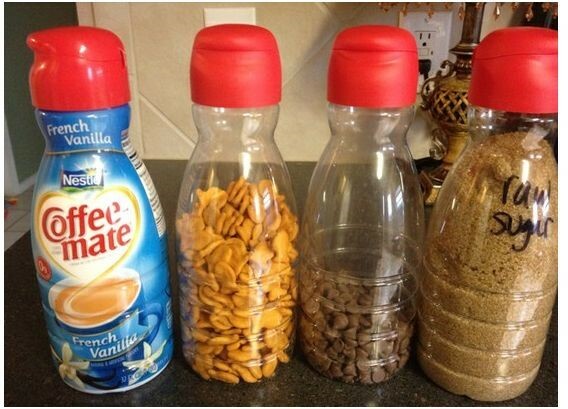 Those plastic bottles are also handy for rationing out things like brown and white sugar that last forever in storage, or once we bust into bulk bags or buckets of snack foods and dry goods. Drink bottles get a lot of play for organizing wire, ribbon, and cord. If you have access to wide-mouth juice or sports drink bottles, those make excellent ways to keep some ammo in a bag nice and dry – but don’t try it with narrow-neck water and soda bottles, not even with .22 LR. There’s nothing wrong with using them for beans or grains, either, since they stack up like cordwood well. Mostly, though, I think people seriously underestimate how much water they need. I may be the only person affected by Uncle Murphy on a regular basis, but you need water stored even with a well, because you need time to hunt down the problem and repair it if the pump goes down. So, for the most part, I’d rather see soda bottles get used to store water, everywhere, in homes and in vehicles. The time spent in organizing not only makes maintaining our storage a little less daunting and time consuming, but also allows us to better visualize gaps. The sanity boost from neatness and not being overwhelmed by our piles o’ stuff can’t really be overstated, either, and less-involved family is less likely to add to our stresses when they’re not overwhelmed by it all, too. Since there’s so many items out there that we can scrounge for free or little outlay and repurpose, we really don’t have any excuse not to keep our storage organized. The post Upcycling for Preppers – Maintaining Organization appeared first on The Prepper Journal.